While the fourth Pirates movie isn’t necessarily being called a “reboot,” I’d say Disney was looking to return the franchise to its former glory after the way the third one managed to completely derail the momentum of the first sequel, which sits in the top 10 of all-time box office list domestically and worldwide. Sure, Pirates: Dead Man’s Chest wasn’t all that great, but it had a solid first film that had ramped up its goodwill with audiences, and for most people, the action/adventure/return to the Jack Sparrow show connected. Then, Pirates: At World’s End finished off the goodwill. People tended to find that movie confusing and stupid. 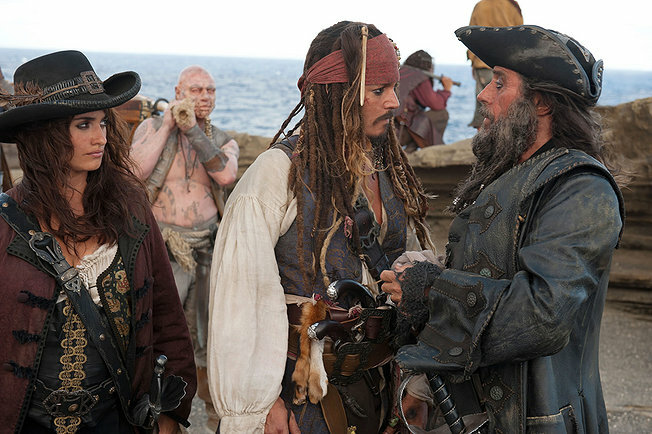 The third Pirates movie did end up making over $300 million, but mainly thanks to a strong opening weekend, when people were still very much in love with the series. Considering the overwhelming popularity of the second film, a loss of over $100 million from the second film must have been alarming. Still, the third movie sits 9th on the all-time worldwide list, still made nearly a billion dollars, and well, most of us would love to fail that brilliantly. The fourth Pirates has the feel of a reboot, with new director Rob Marshall (Chicago, Memoirs of a Geisha, Nine) taking over from Gore Verbinski, and the addition and subtraction of characters. Our favorite movie pirate Jack Sparrow (Johnny Depp) is trying to make a daring attempt to help his long-time first mate Gibbs (Kevin McNally) escape the clutches of the British, who think Gibbs is Sparrow. Somehow, Sparrow manages to get caught, and it’s here that we find out that King George (Richard Griffiths) is hiring pirates to find The Fountain of Youth before those dirty Spaniards find it. That pirate is the one-legged, once-undead Barbossa (Geoffrey Rush). Sparrow manages to escape, then he runs into an old flame, Angelica (Penelope Cruz), who promptly knocks him out and kidnaps him for the movie’s main villain, Blackbeard (Ian McShane). Blackbeard wants to find The Fountain of Youth because a prophecy has foretold that he will be killed by a one-legged man in one week, and should he be able to add years to his life, the prophecy will be broken. Angelica has fooled Blackbeard into thinking she’s his long-lost daughter, and has become the ship’s first mate. They need Sparrow because he’s apparently seen The Fountain and knows how to get there. To complete this mission, they will need to find the chalices of Ponce De Leon and acquire a mermaid’s tear. The problem with mermaids are that they are part Siren, part Jaws. Did I mention Sparrow’s beloved ship The Black Pearl, is sitting in a bottle on Blackbeard’s ship? The fourth movie slims down a lot of the absolute total nonsense of the last two pictures, which is a plus. Also, Penelope Cruz is a welcome addition, and the subtraction of Keira Knightley and Orlando Bloom’s nearly worthless characters is a positive. However, imagination again fails the franchise as the movie ultimately devolves into a billion sword fights and “daring” escape attempts we’ve seen countless times. The mermaid sequence in the movie is the best one, but a rather suspenseful scene turns into a ridiculous free-for-all later on and it nearly ruins it. I don’t blame studios for sticking with a formula, but does everything have to be the same? I mentioned the sword fights, how about the “we never see Jack Sparrow being a captain and going on his own adventure” part of the equation? I know everyone loves to see Sparrow get caught by the authorities, only to wiggle out of capture, and then find himself on some adventure that has been thrust upon him. The franchise has pulled the nifty trick of making Sparrow look like his own man, even though in every movie, he’s in these situations because others want him to be. What is Sparrow like when he is truly free? We may never know, because that’s not the formula. Maybe Sparrow, in his free time, isn’t all that interesting. It’s not surprising that this movie is better than the last two, but it’s still frustrating seeing the things that stay the same that keep the franchise running in neutral. For Pirates fans, however, you can’t go wrong.